Finding an affordable option in Australian capital cities is not easy, especially when you are a first home buyer. Australia’s home loan affordability index has been at the lower end of the scale since its peak in 1993 and 2002, with December 2018 figures showing a marginal improvement of 1.3% over the past 12 months. As affordability continues to be an issue for many Australians, out-of-the box thinking leads to housing and growth options beyond the major capital markets. 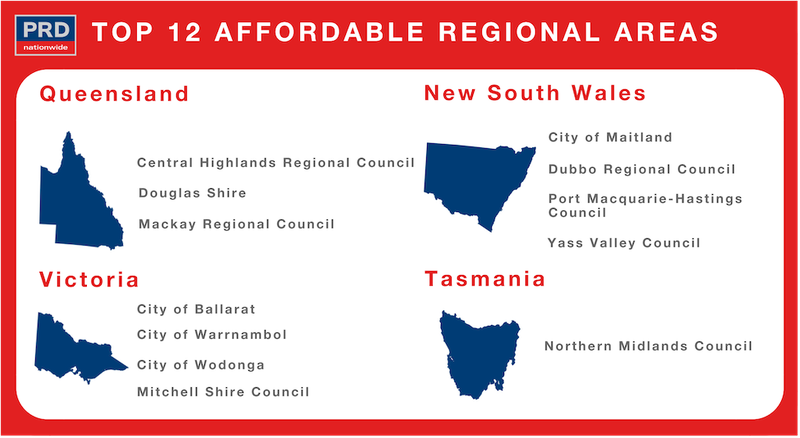 The ‘PRDnationwide Ready, Set, Go Regional!’ report highlights affordable regional areas (hotspots) in Queensland, Victoria, New South Wales and Tasmania. These areas not only have median price affordability, but also provide strong indicators for investment, local job growth, and a sustainable economic future. Affordability – the Local Government Area (LGA) has a median price below the maximum affordable property sale price (average state loan + 20% deposit). Property trends – to ensure statistical reliability, the LGA will have 20 transactions or more in 2017 and 2018, with positive price growth within that time period. Investment – to ensure solid investment opportunities, the LGA will have an on-par or higher rental yield than its capital city, as well as an on-par or lower vacancy rate compared to its capital city. Project development – the LGA will have a high estimated value of future project development, with a higher concentration of commercial and infrastructure projects to ensure a positive economic outlook. Unemployment rate – as of the September quarter of 2018, the LGA will have an on-par or lower unemployment rate than the state average, to ensure there is local job growth.